The (London) DAILY TELEGRAPH newspaper, of 29DEC2009, has published this 'Bookmakers List'. It's all about the odds of airlines likely to go bust. Or not, as we fervently hope. Just how serious it is meant to be, is for you to decide! It struck me that large banks and financial institutions, which have caused the 2008 FINANCIAL CRISIS ('THE CREDIT CRUNCH'), and which brought on the 2009 GLOBAL ECONOMIC CRISIS, seem to get away with their irresponsible behaviour! Most countries saw their governments jump to the aid of the teethering banks, shoring them up with huge cash injections and favourable loans. In the 2nd half of 2009 many banks started to repay those loans, with funding from new share emissions. Not because of common sense, but rather to avoid ruling by governments on putting restrictions on the irresponsible bonuses the bankmanagers share among themselves. While I object to large corporations handing out similar outrageous bonuses, corporations are much less likely to throw entire economies in a depression. While banks have clearly been proven to do so. Those money-grabbing bank directors have to be stopped. I never would have thought a bank would go bust in the Netherlands, the DSB proved to be an eye-opener. Governments and analysts keep telling we are definitely recovering from the GLOBAL ECONOMIC CRISIS, that we are out of the RECESSION, but I don't believe them. Many friends of mine are out of a job, with as yet little hope to find one in the near future. The company I work for saw its workforce cut in half by redundacies. Official figures show the Netherlands had its largest drop in 25 years when 2009 3rd quarter had 140.000 jobs less than the 3rd quarter in 2008. By Sep.2008 398.000 people were jobless in the Netherlands, this is about 5% of the workforce. Average for Europe is 10% (Spain 17,4%). 2010 is expected to see even more people unemployed, while politicians hammer home their mantra: "we are climbing out of the recession". Useless buggers!! If I would have a wish for 2010, I would wish for a clear reversal of those unemployment statistics! 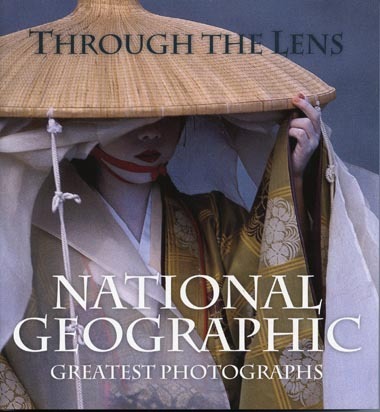 Bought this book recently, a veritable treasure trove of brilliant photography. 250 photos were selected from an archive of over ten million.... A great joy to pick up every now and then and get inspired by such wonderful photography with subjects far & wide, recent and of decades ago. Eskimo ---- Jutdlime pivdluarit ukiortame pivdluaritlo! Gaelic ---- Nollaig chridheil agus Bliadhna mhath ur! By now we of the Lowlands have become accustomed to long waiting lists for any serious surgery, even in life threatening situations such when as diagnosed with an aneurism. One may have to wait 6 months or more. Insurance companies cover certain medical bills if people go abroad (Turkey, Thailand) for treatment. Patients are sometimes given up on because surgery would be too life-threatening, even if their condition is without hope for survival without surgery. People go to Belgium and Germany for a second opinion and find help there. My father underwent surgery in 1997 and almost died 3 times during his 4 months stay: an incorrect diet during recovery from surgery ruptured his gall bladder and he was rushed to intensive care again for immediate surgery. Later Intensive Care became infected by a bacteria and this settled in the wound - his condition worsened and we were called to the hospital during Christmas: he was given up on. But the tough bugger hung on to life and steadily improved. My father was discharged and lived another 11 years, which wouldn't have been possible without expertise medical help. But capacity is thin on the ground in the Dutch hospitals and you'll have to take your chances. This week a colleague told me he had to take his wife to hospital after she fell and hurt her hand & wrist. He went to First Aid at the nearest hospital and was told the waiting time for an x-ray and treatment was 7 hours! She took some heavy painkillers and they went home, properly disgusted. Probably the worse thing is that the government, and higher echelon of our health services, hold on to the opinion that our health service is of an excellent standard and they actually look down on countries where we have to go to for treatment!!! Recently read about Freya Hoffmeister of Germany, she circled the entire continent of Australia in her kayak. She did this in 332 days: 18jan09- 15Dec09, start and finish at Queenscliff. The record for this astounding feat dated from 1982, when someone from New Zealand did the same thing, covering a distance of 13.000 kilometers. Freya encountered crocodiles, deathly jellyfish, poisonous snakes and even was attacked by a shark (which lost a teeth in the attempt!). Some feats are larger than life, I would say. Congratulations! - At 1035 hrs at Kill Devil Hills in Kitty Hawk, North Carolina, Orville Wright pilots the Wright Flyer on a 36.5-meter (120-foot) flight lasting 12 seconds. - German Navy Oberleutnant Christiansen, flying a Brandenburg W12 seaplane, shoots down the British non-rigid airship C27. - The Aero Club of America lifts its ban on flying over cities, allowing pilots certified as "expert" aviators to overfly populated areas. Post Office pilots had been permitted to do this since August. - Douglas choose this famous date, the anniversary of powered flight, to make the first flight of their new Douglas Sleeper Transport (DST). Better known as the DC-3, Dakota, or C-47, this aircraft arguably becomes the most famous transport aircraft in history. - Orville Wright, on the 40th Anniversary of making his first flight, presents the Collier Trophy for outstanding achievement in aviation to his former pupil, General H.H. "Hap" Arnold. - The 509th Composite Group of the United States Army Air Force is formed in Utah, to carry out United States atom bomb operations. - Major Richard Ira Bong, the United States Army Air Force's most successful fighter pilot of the Second World War, scores his 40th and final victory. - The 45th Anniversary of the first powered flight by the Wright brothers is celebrated by the return to the Smithsonian Institution of the original Wright Flyer, which had been on display in the London Science Museum for many years. - A National Emergency is declared in the United States, with plans to speed up production of military equipment. - The United States Air Force claims that its 4th Fighter-Interceptor Wing in Korea has destroyed 130 Mikoyan-Gurevich MiG-15s over the last 12 months, with the loss of only fourteen F-86 Sabres. - The first Lockheed C-5A Galaxy is handed over to the United States Air Force at Marietta in Georgia. - A cease-fire in the Indian-Pakistan war is called and accepted by both sides. - A Hughes OH-6A helicopter, using controllable pressurized air release instead of a tail rotor, makes a successful first flight. - The 50th anniversary of the Douglas DC-3: it is estimated that on this date around 350 are still in commercial service. - The first B-2 Spirit stealth bomber is delivered to the United States Air Force. - On the 100th anniversary of the Wright Flyer's achievement, SpaceShipOne is the first privately-built, manned aircraft to fly faster than the speed of sound. I don't mind its visit, but rather see it getting its meal from the many waterways in the area. A teenage bandit accused of stealing planes and speedboats has become a legend in the Pacific Northwest. Visitors hoping to catch a glimpse of the bald eagles in Washington State's Puget Sound are more likely to see a a different bird in the sky: a police chopper skimming the cedar forests in search of an outlaw. Colton Harris-Moore, a gangly 18-year old has been on the police blotters since he was accused of stealing a bike at the age of 8. Since then he is suspected of having committed nearly 100 burglaries in Washington, Idaho and Canada. Police allege that he graduated from bikes to cars, then to speedboats. Lately he is suspected of stealing 3 small aircraft - without ever having taken flying lessons. Harris-Moore has become a legend in the Pacific Northwest. His Facebook fanclub has over 8.000 members. He had a rough past. His abusive father walked out after choking him during an argument at a family barbecue. His mother raised him in a mobile home, dragged into the woods on the island's South End. Recently his crimes became more brazen. He's been accused of stealing speedboats to travel to nearby islands to plunder empty homes. In novenber 2008, police suspect that Harris-Moore hot-wired a Cessna that belongedto a local radio DJ - he'd ordered a flying manual on the Internet - and crash-landed it 300 miles (some 480 kms) east on an Indian reservation. Since then, he may have stolen 2 other planes, both of which were later found crashed. He apparently walked away from the wrecks unharmed. His mother's reaction: "I hope to hell he stole those planes, I'd be so proud, but next time I want him to wear a parachute." The above is an abbreviated version of the full-page article in Time magazine. 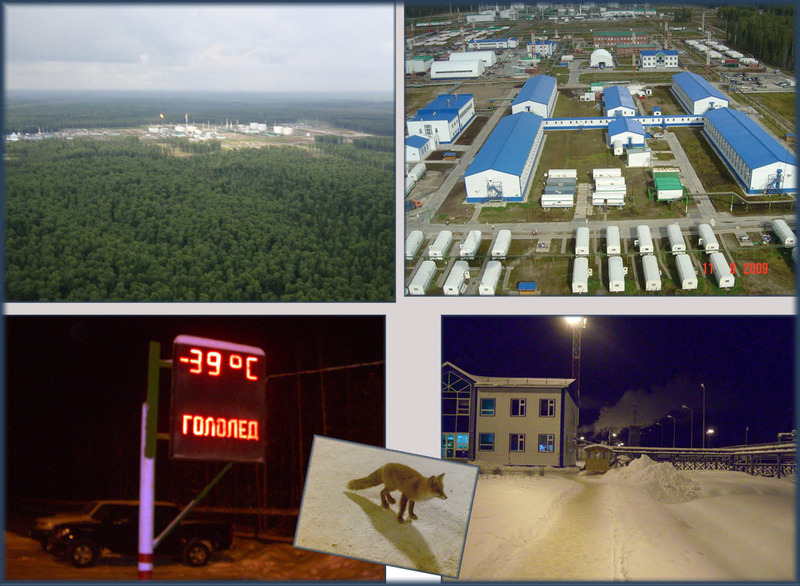 In reference to below, here is a website reader from far & beyond: West Siberia! "I'm working for Shell on their West Siberian project, Salym Petroleum Development. 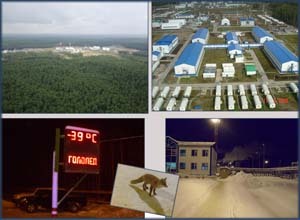 West Salym Oilfield, CPF camp: N60deg 17'29", E070deg 53'51" - www.salympetroleum.ru. Rather civilized place these days, although it used to be quite a middle-of-nothing when we came here 6 years ago (Google Earth and Google Maps are still showing only taiga here, as it used to be in 2004). Well, taiga and swamps, bears and elks, lots of snow and very cold - it's all still here, and to illustrate my point I just walked outside and took a picture of our outside temperature display for drivers... a fox was sitting outside of the front porch, waiting for somebody to feed it). Inside - it's somewhat different now. We've got a well-established and developed field with lot of process and infrastructure facilities, including quite comfy accommodations as well." I am amazed by the amount of visitors each months to my website and it is wonderful to see where they all are! Thanks to Clustrmaps for making this possible! On 07Aug09 the former head of the company that owns Beijing Capital Int'l Airport was executed! He was reportedly convicted of bribery and embezzlement to the value of $16 million, according to Chinese state media. Mr Li Peiying, the former Chairman and General Manager of Capital Airports Holding Company (CAH), was executed in the eastern city of Jinan, Xinhua, after the Supreme People's Court upheld his sentence. His original conviction came in February, after the bribery and embezzlement took place between 1995 and 2003. CAH operates more than 30 airports, including Beijing Capital Int'l Airport and has assets worth over 10 billion yuan and employs more than 38.000 people. When I started to take photos, in the 1970s, for information and inspiration I mainly turned to magazines published in the UK. German photo mags were equally good, but the language wasn't/isn't as easy on the eye as English. The Dutch magazines were too arty for me. Those English magazines ran for a long time an advert series of Olympus cameras. The slogan was, 'Bailey who..?" 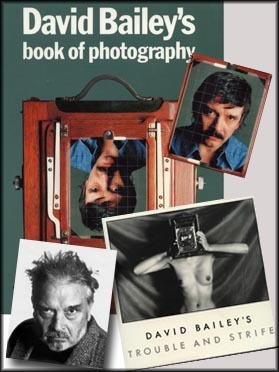 and featured a portrait of David Bailey holding an Olympus OM-. camera. It must have influenced my choice of camera equipment. Not to know him was rediculous, everybody knew him as Mr Bailey was 'rock 'n roll', not just about photography. The (Rolling) Stones, Michael Caine and David Bailey were a league of their own. Mr Bailey drove a Rolls Royce, dressed extravagantly, was married to Rosemary Bramble (1960), Catherine Deneuve (1967, divorced 1972), model Marie Helvin (1975) and actress Catherine Dyer (1986). He also had 'relations' with many models, extending the 'swinging sixties' for many more years. Mr Bailey mingled with Royalty but also the notorious East End gangsters, The Kray Twins. He lived the high life. In 1966, the movie Blowup was made. The film concerned itself with the work (and sexual perks) of a London fashion photographer who was largely based on Bailey. Bailey also directed several television commercials and documentaries. Although my first SLR camera was a camera manufactured in East Germany, an Exakta VX500, for me photography started in earnest with an Olympus OM-1, in 1976. In 1978 I bought a 2nd OM-1 body. After many years these were gradually replaced by an OM-2SP and OM-4Ti. These camera were reliable, small and produced excellent quality. Fond memories. Later I also used a Nikon FM-2 and even a Hasselblad 500CM, but my best memories are with the Olympus OM-1, starting out. Prices were in Dutch Guilders. 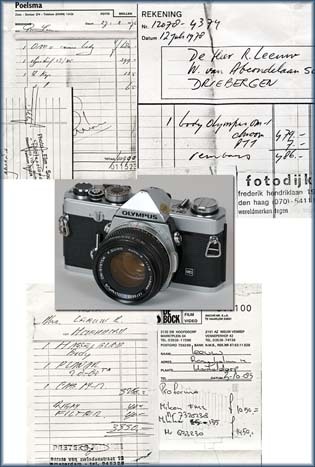 Way before the internet, digital cameras and euros; hard to picture those days again. I came across copies of my purchases when I cleaned up my attic. Kept these copies in my camera bag for a long time in case I was stopped at customs. I never was. Superlatives are lacking to satisfactorily describe the pollution that is floating in stream, lakes, seas & oceans. 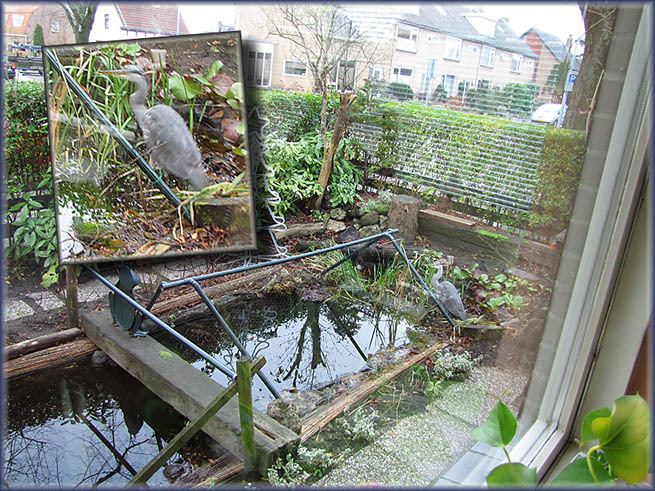 And the effects is has on birds and fish. This problem is in many respects beyond our horizon and easily ignored, but it shouldn't be. Chris Jordan (www.chrisjordan.com) draws it to our attention again and how little is being done about it. Chris describes: "...evidence of a slow-motion apocalypse in progress. I am appalled by these scenes, and yet also drawn into them with awe and fascination. The immense scale of our consumption can appear desolate, macabre, oddly comical and ironic, and even darkly beautiful; for me its consistent feature is a staggering complexity. The pervasiveness of our consumerism holds a seductive kind of mob mentality. Collectively we are committing a vast and unsustainable act of taking, but we each are anonymous and no one is in charge or accountable for the consequences. I fear that in this process we are doing irreparable harm to our planet and to our individual spirits." "The very thing that makes plastic items useful to consumers, their durability and stability, also makes them a problem in marine environments. Around 100 million tonnes of plastic are produced each year of which about 10 percent ends up in the sea. About 20 percent of this is from ships and platforms, the rest from land. The North Pacific sub-tropical gyre covers a large area of the Pacific in which the water circulates clockwise in a slow spiral. Winds are light. The currents tend to force any floating material into the low energy central area of the gyre. There are few islands on which the floating material can beach. So it stays there in the gyre, in astounding quantities estimated at six kilos of plastic for every kilo of naturally occurring plankton. The equivalent of an area the size of Texas swirling slowly around like a clock. This gyre has also been dubbed “the Asian Trash Trail” the “Trash Vortex” or the “Eastern Garbage Patch”. This perhaps wouldn’t be too much of a problem if the plastic had no ill effects. The larger items, however, are consumed by seabirds and other animals which mistake them for prey. 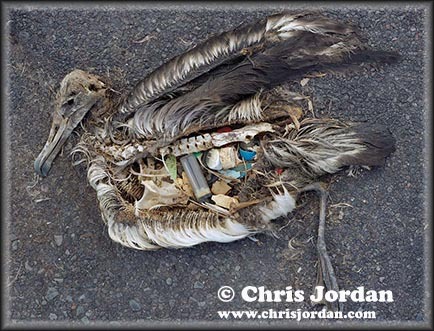 Many seabirds and their chicks have been found dead, their stomachs filled with medium sized plastic items such as bottle tops, lighters and balloons. A turtle found dead in Hawaii had over a thousand pieces of plastic in its stomach and intestines. Of course, not all plastic floats. In fact around 70 percent of discarded plastic sinks to the bottom. In the North Sea, Dutch scientists have counted around 110 pieces of litter for every square kilometre of the seabed, a staggering 600,000 tonnes in the North Sea alone. " Qatar Airways has operated the world’s first commercial passenger flight powered by fuel made of natural gas. Flight QR076 from London-Gatwick to Doha was performed by Airbus A340-600 A7-AGC on 12Oct09. Shell developed and produced the 50-50 blend of synthetic Gas to Liquids (GTL) kerosene and conventional oil-based kerosene fuel. The State of Qatar is set to become the world’s leading producer of GTL kerosene, when it is put into commercial production from 2012. The fuel, as an alternative to conventional oil-based kerosene will contribute to diversification of aviation fuel supply. It also burns with lower sulphur dioxide and particulate emissions than pure conventional oil-based kerosene, making it attractive for improving local air quality at busy airports. The blend of conventional kerosene will be known as GTL Jet Fuel. The flight was the latest step in over two years of scientific work carried out by a consortium consisting of Airbus, Qatar Airways, Qatar Petroleum, Qatar Science & Technology Park, Rolls-Royce, Shell and WOQOD into the benefits of using GTL Jet Fuel to power commercial aircraft. Much of this work is being undertaken at the Qatar Science & Technology Park in Doha. Eddie Izzard, the talented standup comedian and actor, played the Heineken Musical Hall in Amsterdam, Netherlands last night. Tremendous show. How does one play huge halls by his lonesome, he must have thought.. Well, by projecting himself giant-like on the huge decor! Left and right were close ups, so we did not miss any of his mimicking. 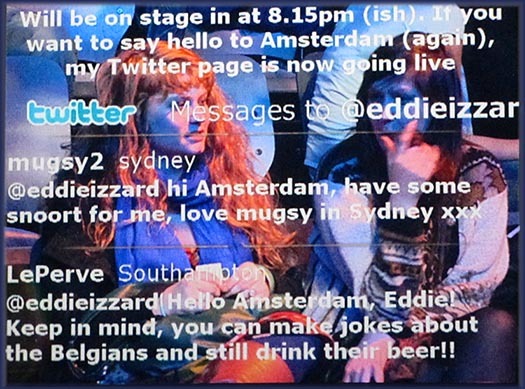 Before the show and during the break these screens showed 'the tweets' sent to Eddie, very entertaining! Well done, yeah.... great show! 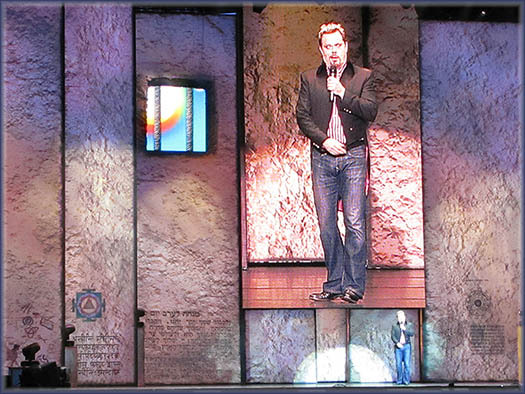 Izzard's style is heavily influenced by Monty Python, especially in his use of a stream-of-consciousness delivery that jumps between topics as he free associates on stage. He does not generally work from a script, owing to his dyslexia. In fact he adresses dyslexia in his show, pleading to change the name into something simpler (for someone who suffers from dyslexia), name it e.g. 'bonk'. It is funnier when he does it! Eddie interrupts himself with new joke ideas, the characters he portrays turn into other characters, and he nonchalantly leaps from historical analysis to musings about household appliances. This often results in brief pauses in the routine which he fills with 'so, yeah,' and other verbal tics that have become his trademarks. Thinking aloud is also part of Izzard's ongoing attempt to make the process of writing the show itself part of the humour. During this show he follows evolution, from dinosaurs, tools in the Stone Age, people learning to talk and why, Noah's Ark, farming, 1066 the Battle of Hastings, the Bayeux Tapestry (early frontline journalism) and the Battle of Thermopylae (2nd Persian invasion of Greece)... and his characters such as the Raptor (grrr...) and the Jazz Chicken reappear during the show. Trust Eddie to present this with his personal touch and feel for the absurd, Monthy Python-like, humor.! Weird beyond our visible bounderies of weirdness. He frequently notes the reaction to a joke midstream by miming writing on his hand ("should be funnier" or "lost them there"), asks the audience questions, and verbally engages with hecklers. On 18 March 2007, Izzard was listed as number 3 of the 100 Greatest British National Comedians (just behind Peter Kay at number 2 and Billy Connolly at number 1) as part of British television station Channel 4's ongoing 100 Greatest... series. 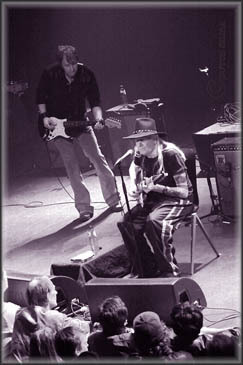 Johnny Winter, the Blues musician and legend, played in Haarlem's Patronaat, in the Netherlands. 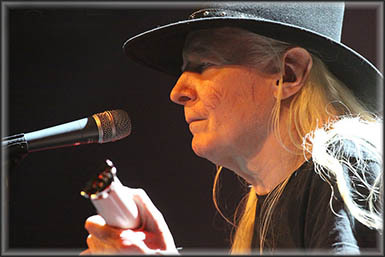 John Dawson 'Johnny' Winter III was born on 23Feb1944, so that would make him 64 when he played the Patronaat on 11Nov09. Many a musician with the life-style to match did not last that long. And Johnny shows the toll of hard living (read he was a heroin user at some point) too. He played a mean gig here, powerful stuff. 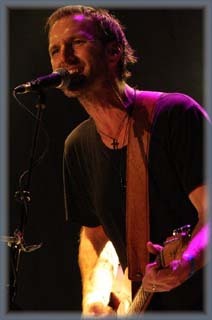 While his voice had surprising power, I think (to my taste at least) the guitars overpowered his singing. But what rythme this man played, he played that guitar at hispeed, none of that laidback stuff. 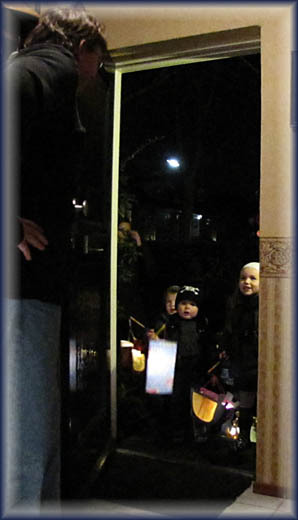 Trick or Treat - Dutch style! None of these kids probably know the tradition of celebrating the holy Martinus, bishop of Tours, born in 316 (Sabria, Hungary). In fact I learned about him when I googled this subject, the educational power of the internet! "We are photographers & concerned citizens living in Los Angeles. / With the goal to shoot photographs freely in public spaces wherever, whenever, of whoever. / And a desire to get the word out, educate and engage. " Initially, I was outraged (confirming my fears for US Law Enforcement, having been interrogated in similar fashion in 2005) about this event and applauded this being put out in the open. On second thought, the fact that photographer had a video & sound recording running from the start, explains why the photographer doesn't make any effort to explain to the policemen why he is taking pictures in the subway. He is about 'his constitutional rights' from the start. And then the policemen start about their rights... An arrest is made, things get from bad to worse. The policemen make an effort to explain their motivation but get stuck in a loop. The police officers' point of view is that someone taking pictures in a subway system, could be or lead to an act of terrorism. By Al Qaeda. And that is the scary part for me, as a photographer and a person: policemen making random arrests of people involved in such innocent acts as street photography. Or whatever the police conjure up to be an activity that may lead to, if you think far enough down the line, a threat to public safety. Al Qaeda has destroyed far more than a few buildings and the lives of the 9/11 victims & families..... They have kindled the fires of our most basic fears and it burns out of control; the bad guys in their caves don't need to take further action as we will turn on ourselves. What do I know of global warning? Nothing much, except that in the history of Mother Earth it has happened before. It cooled down too. Up and Down. Much ado about what to do about it. Solar activity by that large lightbulb in the sky, and active volcanoes, effect our atmosphere far more than cars do. Cows make up a quarter of the world's pollution through their belching and farting. Brazil has a cattle herd of 200 million. Where to begin? Meanwhile, in Alaska, communities are doomed to disappear because of coastal erosion. 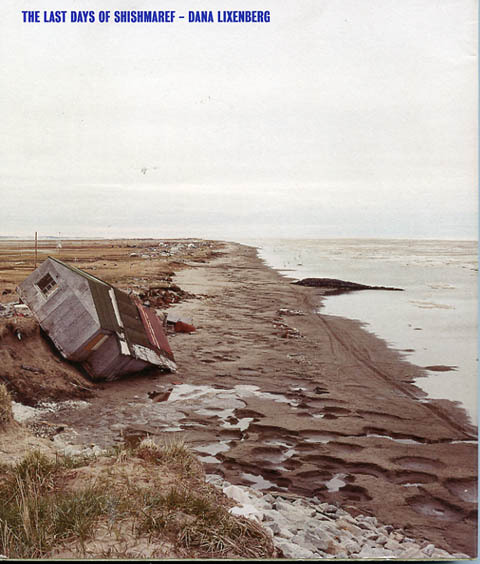 Kivalina is one of these communities that is gradually being washed away by the ocean, due to natural erosion, expedited by the effects of global warming. The ocean now no longer freezes up during early autumn, before the storms come, but much later in the year. People even use parts of derelict aeroplanes to fortify their coastline. Shishmaref is another such community, between a rock and a hardplace: the ocean eating up the coastline and people moving out due to the lure of modern living. Photographer Dana Lixenberg stayed in Shishmaref for several weeks in 2007. She documented Shishmaref, a village on a small island off the coast of Alaska, which is getting swallowed by the sea. Due to climate change, the island's permafrost layer - its main protection against erosion - is melting, leaving the sea little restraint from reclaiming what is left. A fascinating book and document. As such one can say that whatever happens, able to divert disaster by global warming or not, it certainly provides fascinating photography. If our species vanish from this earth, we will be well documented. 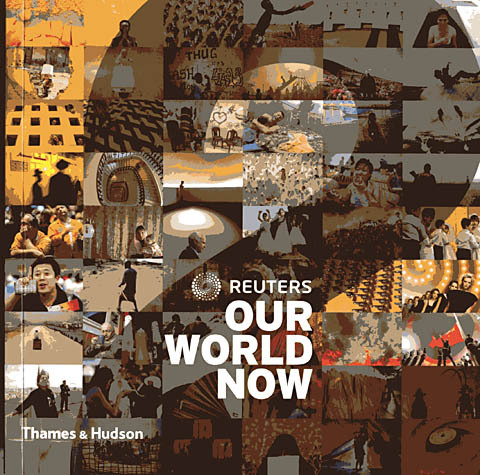 I stumbled on the 2nd edition of this masterful product: The year 2008 in photos by Reuter's photographers. Last year I had also bought the no.1 edition, but had forgotten to keep track of it possibly becoming a tradition. Am glad that they have done just that. Engaging, often moving, photography of major events. And a rightful tribute to these news photographers. 'At the top of the hill he turned and studied the town. Darkness coming fast. Darkness and cold. He put two of the coats over the boy's shoulders, swallowing him up parka and all. Will we be able to find our stuff? Yes. I know where it is. What if somebody finds it? They listened. Then in the distance he heard a dog bark. He turned and looked toward the darkening town. It's a dog, he said. My son Alexander recommended me to read this, while 'on the road' ourselves. Unnerving and fascinating. Black on black. Incredible but true: they made a film of this book... It is titled 'The Waste Land'. Starring Viggo Mortensen, Kodi Smit-McPhee, Charlize Theron. Intend to see it. Over the years I have been most fortunate in receiving wonderful reponse and support to my website. On some of my travels I have visited some of my staunch supporters or with whom I had that 'click'. This time we were welcomed in Kingston (Ontario), to visit Danielle & Neil Aird and we had the most warm-hearted and wonderful stay. 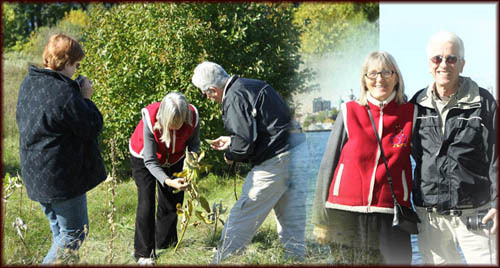 More can be read on my 'traveloque' : Autumn Leaves, Canada 2009. The following was written by Mark Twain as an Afterword (in a book called A PEN WARMED-UP IN HELL), and titled 'The Whole Human Race' (1907). 'I have not read Nietzsche or Ibsen, nor any other philosopher, and have not needed to do it, and have not desired to do it; I have gone to the fountainhead for information-that is to say, to the human race. Every man is in his own person the whole human race, with not a detail lacking. I am the whole human race without a detail lacking; I have studied the human race with diligence and strong interest all these years in my own person; in myself I find in big or little proportion every quality and every defect that is findable in the mass of the race. I knew I should not find in any philosophy a single thought which had not passed through my own head, not a single thought which had not passed through the heads of millions and millions of men before I was born; I knew I should not find a single original thought in any philosophy, and I knew I could not furnish one to the world myself, if I had five centuries to invent it in. "Most people are just about as happy as they want to be."